Living cells are characterized by a great diversity of separate internal spaces, the boundaries of which are made of membranes forming convoluted surfaces of manifold shapes. Sculpting these shapes is achieved in many cases by proteins. A single protein is too small to bend the membrane into useful shapes, such as spheres or tubes, that measure 10-100 nm, or more, in diameter. Indeed, the proteins work in teams, but exactly how remained a mystery. Now a computational study elucidates the membrane-sculpting process for proteins called amphiphysin N-BAR domain. Simulations performed with NAMD had revealed a first glimpse earlier (see the Sep 2008 highlight). The new study showed that multiple N-BAR domains form lattices maintained through electrostatic interactions. 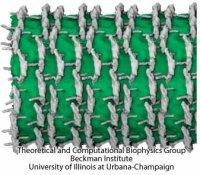 Positively charged, banana-shaped surfaces of individual proteins bend the negatively charged membrane, while the lattice formation ensures a uniform bending force across a wide membrane surface. In a dramatic example of computational "microscopy" the 200 microsecond sculpting of a large flat membrane into a complete tube was observed. More here. Anton Arkhipov, Ying Yin, and Klaus Schulten. Four-scale description of membrane sculpting by BAR domains. Biophysical Journal, 95:2806-2821, 2008. Anton Arkhipov, Ying Yin, and Klaus Schulten. Membrane-bending mechanism of amphiphysin N-BAR domains. Biophysical Journal, 97:2727-2735, 2009.